This ‘quirky prairie hippie’ says granite gravestones and cake have more in common than you'd think. In butter tarts, raisins or no raisins? "Raisins. Love raisins. Raisins in everything." Devon describes himself as a "quirky prairie hippie" who also loves crocheting and making pottery. In addition to being a baker and substitute teacher, Devon is a third-generation gravestone carver. At first glance, it might seem that carving gravestones and baking couldn't be more different, but Devon says they actually employ very similar skills. "You have to be exact, you have to be precise," he explains. "There are no do-overs when you're working with granite. That formality and rigidity help me a lot." 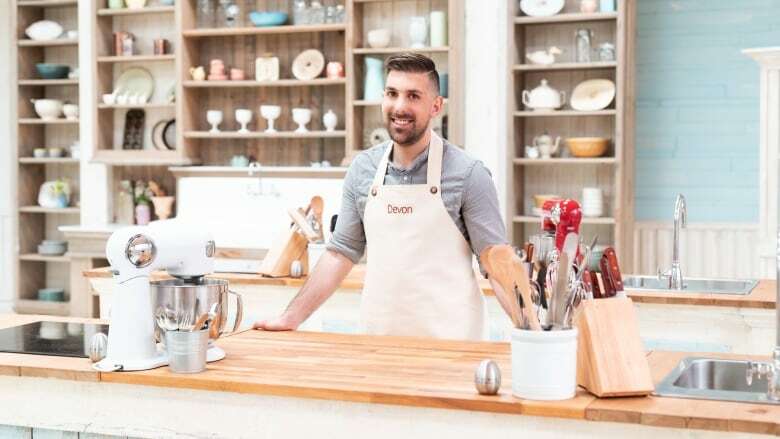 Devon says baking is part of his identity and personality. After spending three years in Japan — where he didn't have an oven — he felt like he'd lost a part of himself. That said, his world travels have had a big influence on his baking style, opening his eyes to new flavour combinations. "I'm not the most social person," he says, explaining how baking became so central to his life. "I've found that you can win people over really quickly if you give them delicious things."